Protesters from same mob that burned downtown theater to ground in 2010 barred from using nearby theater as protest venue. Movie is still playing nationwide. The central figure in “The Hunger Games,” the hit sci-fi series about an oppressed people’s struggle against a totalitarian regime, is being evoked for real, now, in Thailand among university students expressing their opposition to that southeast Asian nation’s military rulers. CNN would also admit that the “opposition” consisted of “several students,” in fact, not even 10 nationwide, but before claiming inexplicably that, “there’s little indication the opposition is going away.” And perhaps CNN is right – if one considers what the “opposition” really is. If it is actual people in Thailand, there is obviously no opposition. If it is special interests upon Wall Street and in the City of London that hand CNN, the BBC, and other news organizations their talking points, then indeed, the opposition remains. A “Hunger Games” fan club, which consists of university students calling for democracy in Thailand, had planned to meet for the latest film’s showing Thursday at one Bangkok theater. But the showing at that theater and three others that are part of the same Apex chain was canceled — for “technical” reasons, according to the chain. 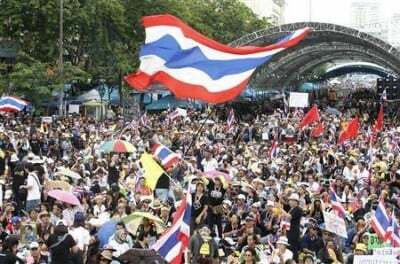 However, these “students” are in fact supporters of ousted mass murderer, Wall Street proxy, and dictator Thaksin Shinawatra, Also known as “red shirts,” these supporters have been footsoldiers of Shinawatra’s political machine for years and at the center of some of the most violent incidents in recent Thai history. In 2009 Shinwatra’s red shirts would gun down two shopkeepers amid attempts to loot their storefronts during a Bangkok riot led by Shinawatra’s political party. The following year, Shinawatra would again stage street riots, this time including some 300 heavily armed professional mercenaries triggering violence that would leave nearly 100 dead, thousands injured, and the city in literal flames after his supporters carried out widespread arson. Image: Apex, the company that owns two theaters it has barred students from protesting at, had a third theater burned to the ground in 2010 by members of this very same political movement. CNN, the BBC, and several other Western media outlets have attempted to portray the recent “crackdown” on these mobs as “repression,” conveniently leaving out their penchant for violence, intimidation, arson, and terrorism. 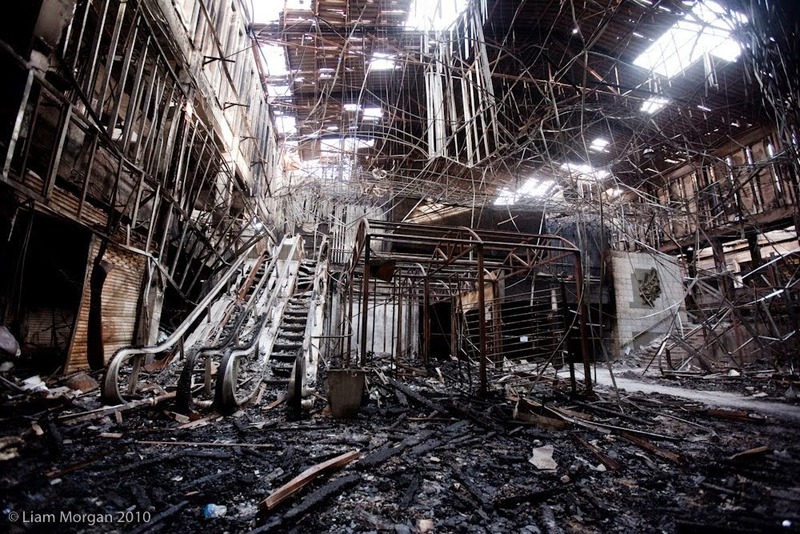 One of the buildings burned to the ground by Thaksin Shinawatra’s red shirt supporters was Apex’s “Siam” theater. Suddenly, with this fact in hand, CNN’s narrative about the government “repressing” the “students'” “free speech” is turned on its head. In reality, the government is stopping pro-terrorists who have already killed and maimed people, burned down buildings, and in general have committed themselves to a campaign of violence and intimidation, from once again building momentum leading to yet another costly street conflict. Apex, who barred these protesters from using their remaining theaters as a venue for their agenda, is rightfully concerned when one considers the fate of their “Siam” theater at this groups’ same hands. Additionally, if CNN and other Western outlets truly believe these “students” have a right to disrupt ordinary people and stage venues at businesses they have literally burned to the ground in the past, surely they believe these businesses have a right to deny them use of their property for their venues. Likewise, students up north who were detained after interrupting the Thai Prime Minister’s speech seem to have lost the irony of complaining about their “free speech” being infringed upon while in the process of trying to silence their political opponents.